I was in charge of getting four of the five flowers girls ready to walk down the aisle, after my hairstyles became the talk of the town during the summer holidays. There was a slight panic in the moments before the ceremony was meant to start as Pickle kicked up the most epic tantrum, screaming and crying because I left to go and join John in our seats. Roco Clothing's Skylar dress is available in sizes from six months to four years, and the shoes in sizes infant 5 to junior 3 so with Pickle wearing the smaller sizes of age two and infant 6 you'd expect her to simply look super cute as a flower girl. What I wasn't expecting, however, was for the beautiful outfit to make her appear so grown up. 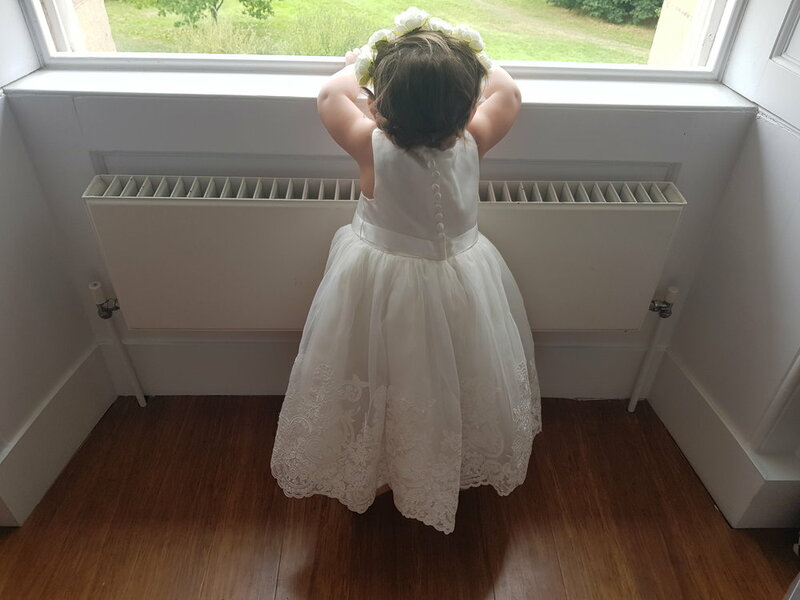 There is something endearing about a little girl in ivory or white; and as well as being the most adorable child in the room, Pickle suddenly seemed so much older than her 18 months. My brother and his wife (!) shopped at Claire's for accessories for all the flower girls and chose some beautiful pearls and flower headbands. With the layers of tulle, satin and organza built up to make the amazing, full skirt at the base of the Roco Clothing Skylar dress the headband was a ideal match. Additionally the beadwork on the bodice meant the pearl necklace and bracelet sat perfectly, especially with the blush pink (their chosen wedding colour!) contrasting against the ivory of the dress. The organza top layer of the Skylar dress is adorned with a stunning array of lace trim patterns. The lace trim covers the base half of the dress skirt, and is made up of a selection of floral and swirl designs. As you can see in the photo below, it also has a line of faux buttons (which cover the zip fastening beneath); which, together with lace appliques and small square bow to the front, add a traditional touch to this gorgeous Roco Clothing flower girl dress. Every detail added to how wonderful this dress looked on Pickle, and made it the perfect addition to my brother's wedding day. My girls are both tall (thanks to getting the tall gene from their 6ft3 daddy!) and often it means that dresses can be an odd fit, being wrong in the length whilst fitting at the waist or vice versa. 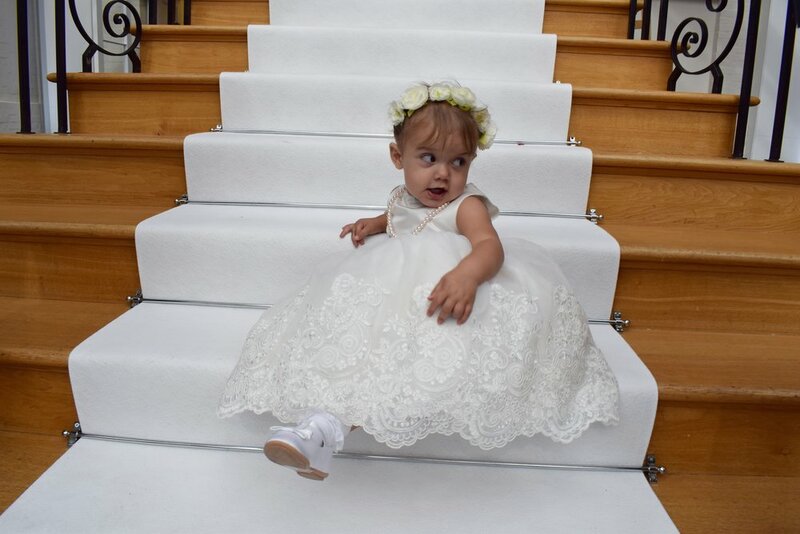 Thankfully the fact that Roco Clothing's Skylar flower girl dress is ballerina length, it got Pickle perfectly, floating an over her ankles allowing her to run and play after the ceremony with ease. Despite it's full skirt and many layers, this Roco Clothing Dress was light and easy to move around in. Pickle showed no sign of discomfort throughout the day from start to finish; including during a nap, and dancing the night away under the disco lights. I don't think I need to explain this one, the photo below does all the talking for me. Pickle looked beautiful in her Roco Clothing flower girl dress and shoes; and alongside the bridesmaids, flower girls, groomsmen, bride, groom and even us as her parents, she totally stole the show. 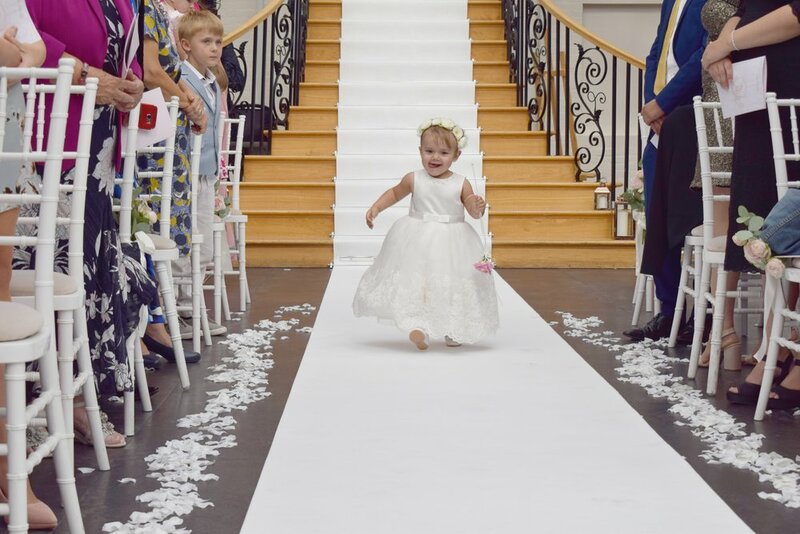 I was so proud of my baby girl for her cute little trot down the aisle, leading the way for everyone else to follow before the entrance of the bride. She was such an awesome flower girl, and we cannot thank Roco Clothing enough for making it possible. Roco Clothing offer a wide variety of stunning dresses, suits and shoes perfect for every occasion from weddings to Christenings to parties; so be sure to visit their website and kit your children out for your next big event. For more reviews of products and services we use in our lives as parents raising our two girls visit my reviews page. If you have any questions about the outfit Pickle wore from Roco Clothing which I have not covered in this post, feel free to ask in the comments section below. Disclaimer: I was sent the Skylar flower girl dress and Tulip shoes in return for an honest review. The review words and opinions are my own. All photos are copyright property of Me Becoming Mum.